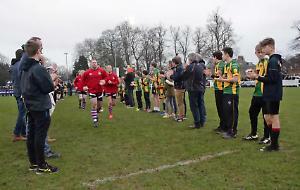 HENLEY BULLS’ first home game of the season was a closely fought contest played in the pouring rain last Saturday with both teams looking to throw the ball about. Richmond started strongly and within minutes were 7-0 up. The visitors continued to dominate possession but the Bulls defence started to get them back into the game with some big hits going in from captain Scott White, Harry Jackson, and Dan Foley. With the Bulls not being able to get their hands on the ball the pressure soon told and Richmond were able to score again to make the score 12-0 after 20 minutes. The Bulls forwards then started to take control, first at the scrum where the front row of Zack Clarke, Elliot Deacon and Simon Morris took a scrum against the head which gave the Bulls confidence and they started to win the gain line battle. A good take in the line-out by Liam Goodison set up a maul which took the Bulls to the try line and Scott White pounced over with Sam Quelch adding the extras. The Bulls now full of confidence started to take the game to Richmond with forwards dominating. The try of the game was scored by Bulls when a line-out won on their own 10m line allowed a strong carry by Day and quick ball allowed Quelch to put George Griffiths away and he sprinted 50m to make it 12-12 at half-time. The second half started in similar fashion to the first as Richmond came firing into the Bulls and scored early. The Bulls were struggling to get out of their half so a good defensive effort kept Richmond out. However, the pressure told and Richmond scored again to make it 24-12. As in the first half, back came the Bulls, with powerful runs from Day, Edwards and Stevens, breaking the line and putting Richmond under pressure. The forwards were soon rewarded with a penalty try to make it 24-19 with 10 minutes to play. With the Bulls looking to attack a pass was well read and intercepted and looked a certain score, Griffiths making a 40m chase to make the tackle and force a knock on. The Bulls worked their way up to 30 metres out before the final whistle sounded.